Who ever knew a kid could be so excited about achievement tests! Well, leave it to AbiNoelle to get excited about a test. It’s hard to believe that we are within a month of completing the K5 school year! Soon our little worker will finish that last page of seatwork (What a RELIEF! ), look back at all she has accomplished this year, and with a smile of satisfaction be able to enjoy a good time of celebration with our homeschool group, friends, and family. She can read! Wow! Through a phonetic approach, AbiNoelle’s reading skills are soaring. Everywhere we go she is reading something. Storybooks bring lots of excitement, and how special it is to be able to go to the library for her to pick books that she can read on her own. That’s why we agreed to review Eclectic Foundations – it is phonics based and provides a great resource for extra reading practice using the morally sound and time-tested McGuffey Readers which were used throughout American education until the 1960s when phonics was rejected and replaced with the Look-Say method. The Teacher’s Guide – outlines 144 simply lessons to complete using the student workbook, phonics practice sheets, and word cards. The Student Workbook – includes poetry, lined areas for cursive writing practice, and very simple grammar exercises. Phonics Practice Sheets – 17 laminated sheets for practicing writing/forming words using basic phonics sounds and patterns. Each item listed above is simply printed in a monochrome fashion with each book being spiral bound for ease of use. 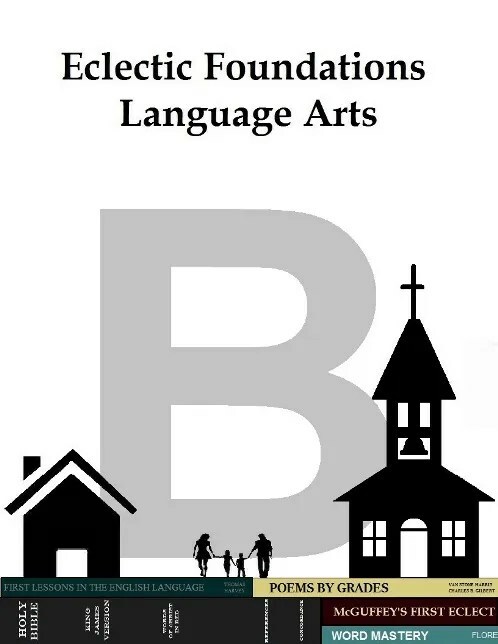 Eclectic Foundations offers the option of purchasing all the items as described, downloading a pdf version of the items, or a mixed package depending upon the purchaser’s budget. The McGuffey selections were at a great reading level for AbiNoelle and she enjoyed reading every selection. The Poetry selections were interesting and fun to discuss. The Teacher’s Guide gave excellent comprehension questions to ask the students which served as a great starting point for further discussion. AbiNoelle enjoyed working to color code the word cards according to the various parts of speech being learned. 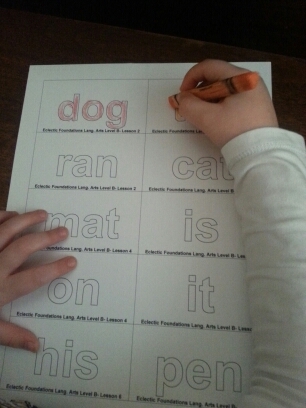 AbiNoelle always looked forward to using dry erase markers to practice words on the Laminated Phonics Worksheets. The overall curriculum and guide are simply formatted; however, it seems slightly confusing that each aspect of the lesson (i.e. phonics word cards, phonics practice sheets, reading selections, poetry, cursive writing) are not correlated to work together. In fact, if one preferred, you could use each area by itself. The Teacher’s guide lays out each lesson very clearly; however, it seems it is needful for the teacher to independently create ways to convey the material to the student in a way that he/she will understand. For example, in Lesson 4 the Teacher’s Guide states: “Is is a verb (green). A verb expresses action or state of being. On is a preposition (blue). A preposition shows the relationship between a noun or pronoun and other words in a sentence.” AbiNoelle did not understand “expresses action,” “state of being,” or “relationship between a noun or pronoun;” therefore we had to work beyond the curriculum plans to explain these concepts, otherwise she would have just been memorizing a list of words to be certain parts of speech of which she would have had no idea as to what all that meant. The Reading and Poetry selections were an excellent source of extra practice and learning. The laminated sheets were a fun addition. Including the grammar concepts into each lesson at this stage was a great idea, but needed further teaching and practice than what was indicated in the lesson guides. To be able to download all material for $30 is a great resource!